I recently talked to a friend about work and life, and the struggle to balance it all. It’s something every working mom faces, right? What’s her secret? She says no. A lot. “Though I wish I could do it all,” she continues. “I have to remind myself that I chose this career path because I wanted to be a professional who could still be fully present for my kids.” So, she says no a lot. Could this work for me, too? I wondered. This idea of saying no more often reminds me of a new resource that is now available. 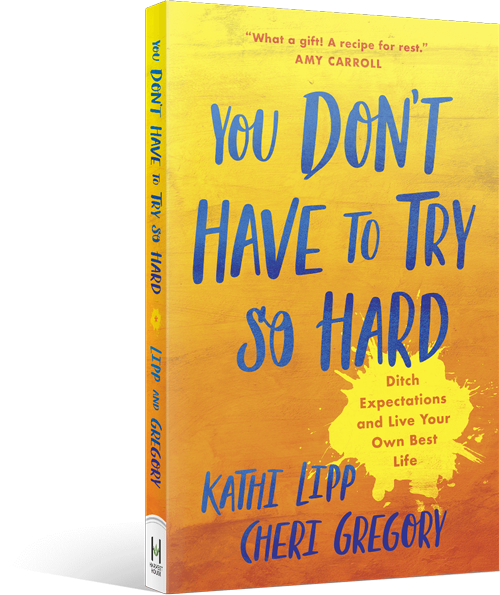 You Don’t Have to Try So Hard, by Kathi Lipp and Cheri Gregory, is a step-by-step guide to ditching expectations so you can live your best life. 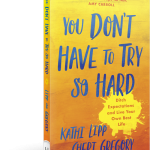 You Don’t Have to Try So Hard encourages women to rebel against the bullies of perfectionism, people-pleasing, performancism and procrastination. I like to think I have the performancism bully under control. But he’s a sneaky little devil that makes me say yes when I should say no. He tricks me into thinking productive people are busy people, making the reverse equally true. The truth is performancism creates chronically tired and unfocused people. We have to learn to say no and put up a fight against performancism. Take my friend, for instance. 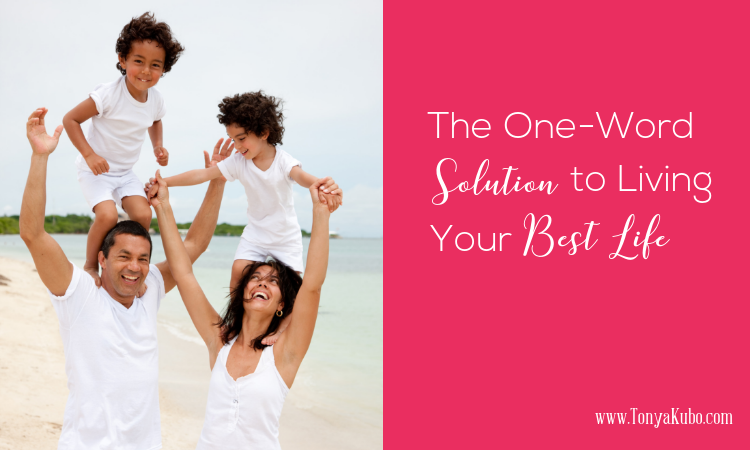 She’s a global entrepreneur and a homeschooling mom. If she’s going to be the kind of mom she wants to be, she can’t live life on an airplane. She’s decided she can travel internationally three times a year – and those three times better be worth it. She says no to a lot of little things so she can say yes to the big things – the handful of jobs that bring in most of her annual income. If this compromise makes you cringe, you might be bullied by performancism. I know performancism has forced a yes out of me way too many times in the past. I thought placing my self-worth in my accomplishments made me ambitious and successful. But performancism never allows us to enjoy our success. Instead, it puts us on an endless hamster wheel of trying harder until we collapse from exhaustion. Anyone else out tired there? I can guess that many of us have performancism to thank for that. I have since tried my friend’s way of doing things, and it’s making my life better. But like my battle with clutter, it’s obviously not “one and done.” It’s a regular struggle to say no to the little things to make room for saying yes to the people and opportunities that are most important to me. So, what’s a bullied girl to do? Stand up and say no. Performancism, you’re not in control anymore. For those of us who like to “do,” it’s tempting to say yes to anything that puts us in action. But getting off the hamster wheel of performancism requires us to filter requests, ensuring we are clear on what’s expected, what’s required, and what success looks like. In You Don’t Have to Try So Hard, Kathi and Cheri recommend asking yourself whether it’s something anyone could do, or if it’s something tailored to your skills/experience/calling. The answer will clearly indicate whether the request is an automatic no or an intentional yes. When learning to say no, it’s tempting to apologize or imply you’re willing to negotiate. This hesitation will keep you spinning on the hamster wheel. Instead, we must say no with confidence. We can do that whole-heartedly when we are aware of our goals. It’s “N-O. Period.” No apologies. No hedging. No explanation required or recommended. Saying no today lets you live your best life by giving you the time, energy and availability in the future to do what you are truly meant to do. Doesn’t that sound so much better than being stuck on a hamster wheel? If you’ve spent years as a “yes woman,” saying no will not be easy. But it is worth it. Are you excited, like me, to learn more about how to eradicate performancism and the rest of its motley crew from your life? If so, I’d like to invite you to an online book study I’m leading of You Don’t Have to Try So Hard. This six-week study begins September 9 at the Clutter Free Academy Facebook group and will include live discussions in the group every Monday at 5 p.m. PST. Want to join us and rebel against the bullies? Get your book today or find out more information at YouDontHaveToTrySoHard.com. Comment below with an example of how you can either filter requests or use “no” as a complete sentence in the coming week. 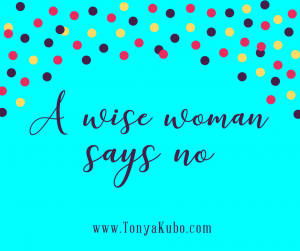 Learning to say no was by far one of the most difficult tasks I have played with in life…..and I’ve given birth three times!!!! I say played with because like clutter it’s a life long roller coaster. The feelings of needing to say yes or they’ll hate me, judge me, leave me out in the cold come back and whisper in my ear like that little devil from cartoons we all grew up watching. I have only had one time where someone questioned my no. I’ve even stopped mostly giving excuses for my no. Yet I still have friends. I still have work. I still keep busy. However it allows me time to find my self care, enjoy being a mom or a daughter or a wife. Take my advice and cut it cold turkey for 30 days. Unless truly mandatory for work or life say no. You’ll work through so many feelings and thank yourself at the end. Ooohhh….maybe we need a “no” challenge around here? That could possibly be amazing. Thank you for sharing your experience, Emily. 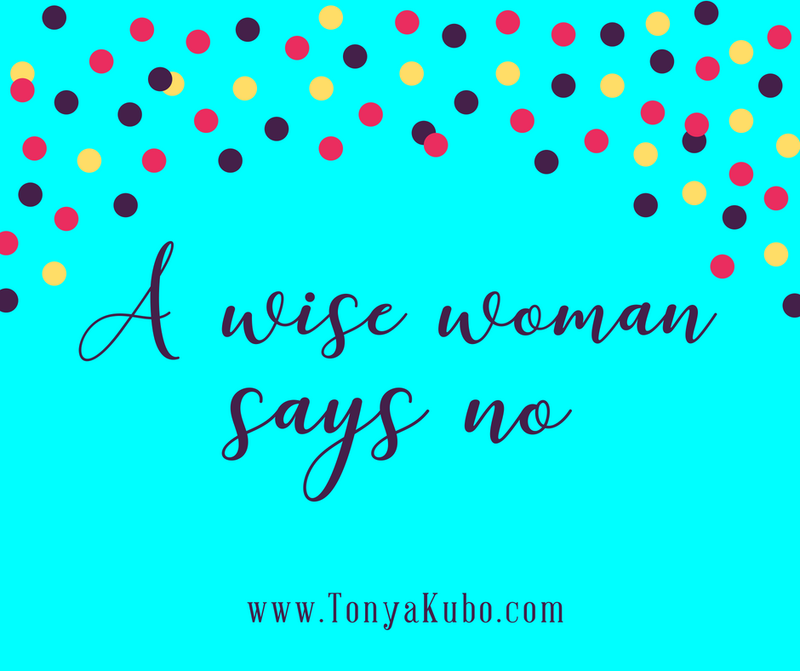 I love that you recognize saying “no” – though difficult – didn’t damage your relationships or career opportunities AND strengthened your joy in life. I’m getting better about saying no, but saying no add a complete sentence is definitely a challenge. In my direct sales group, we’ve done challenges to see how many nos we can get to help us get used to HEARING no. It would be fun to have a challenge to practice SAYING no! Thank you for sharing, Lori! I am seriously considering this “no” challenge. Can you imagine how much time we could all earn back in the course of a month while practicing the act of saying no as a complete sentence? Sometimes it’s just being honest with myself, I want to say yes but I CAN’T and shouldn’t. Fighting the No guilt, not letting it win.